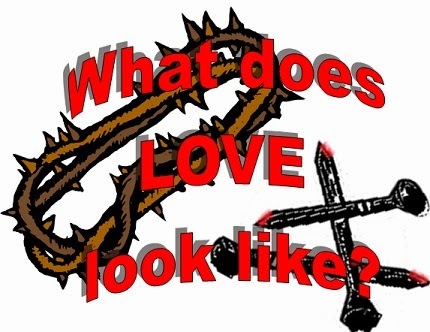 In Him... : What Does Love Look Like? What would happen if we (the church) believed that the love and grace we found in Jesus Christ is available to everyone else too? What if we begin to show mercy as we have been shown mercy? What does that look like? What if we were to reach out in love like God reached out in love to us when He sent Jesus? Would we treat people differently - Even those who we consider "big" sinners? Would we be as quick to judge and condemn others when we really understand the love and liberty we have in Christ? Would we walk out the ministry of reconciliation? What does that really look like? A couple of things I encountered this week really stuck in my mind. One of the sparks for this blog entry was the movie, "Holy Ghost" by filmmaker Darren Wilson. Fortunately, I was able to see premiere this past weekend, and it was very inspiring and powerful. I believe it is Darren's most evangelistic film to date, but it's not preachy. It shows how the Holy Spirit leads people to minister love and healing to people. People from Salt Lake City, UT to Varanasi, India. Varanasi is the birthplace of both Hinduism and Buddhism. The movie expresses that God's love is for everyone, and He is wanting to express His love through all of His church. It is another influential film from the same man who brought us, "Finger of God," Furious Love," and "Father of Lights." The other thing that sparked this writing is something I saw in the news about a church refusing to allow a man's family to have a funeral for him because of his gay life. It hit me because I had just read about the horrendous persecution of Christians in Iraq (and Syria) by ISIS. It just struck me that there are so many more things that we could be concerned about in the church than the sins of a dead man. I honestly believe that there is a "new wave" flowing in the church today that is causing believers to really reach out to others in love. We are starting to lay aside all the prejudices we have against those who don't believe the same way we do, or even against "big" sinners. How can we reach people for Jesus if we do not love them and how can we truly love people if we are holding their sins against them? 2 Corinthians 5:19, "…God was in Christ reconciling the world to Himself, not imputing their trespasses to them, and has committed to us the word of reconciliation"
I was thinking about passion the other day and I asked myself, "What am I passionate about?" I then asked the Lord, "What are you passionate about?" The Lord spoke to my heart that He is passionate about people! God is in love with people. He is so in love with the people of this earth that He sent His only Son to come and live a sinless life, not hold any of our sins against us; but rather become sin for us, and died on a cruel cross for our sins! My hope is that I would become passionate about people the way the Lord is. That I would not hold people's sins against them, but I would show the love of God in a real way. © 2014 Bret Trasamar. Simple theme. Powered by Blogger.